This is a lovely 10″-15″ multistemmed perennial. 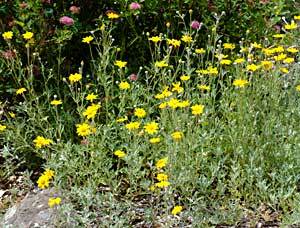 Leaves are bluish green, 1-3″ long, woolly and deeply lobed. 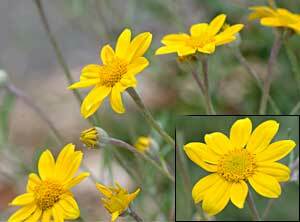 Single, yellow ray flowers surround a prominent disc flower. Found in dry open habitats on bluffs and slopes. Native from S. BC to S. Oregon. This entry was posted in *****. Bookmark the permalink.